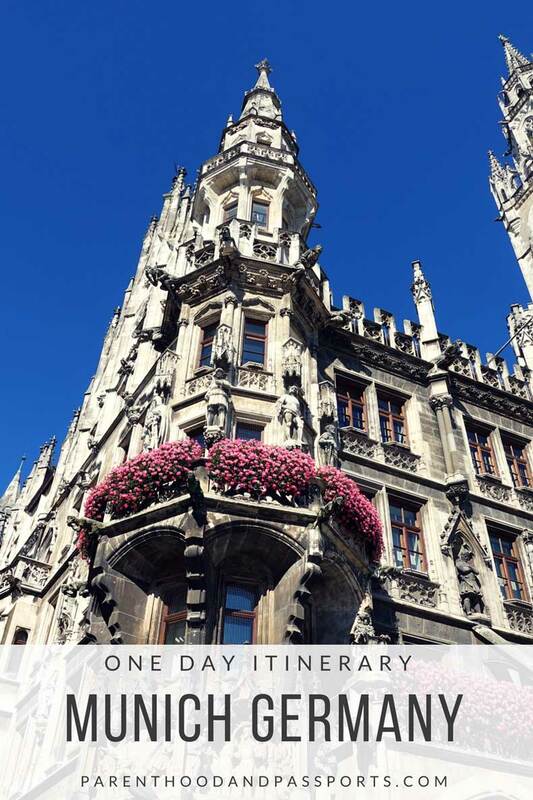 During our two week road trip across Central Europe, we spent one full day and one night in Munich, the tourist capital of Germany. When staying in a city for only a short time, I always select our hotel based on location and convenience. That means we are willing to spend a little more to maximize our time. 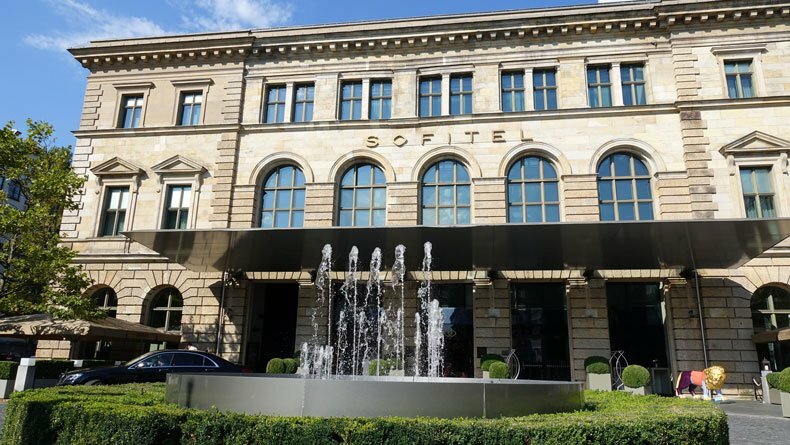 We stayed at Sofitel Munich Bayerpost Hotel which is located directly next to the main train station. This is an ideal place to stay if you only have one day in Munich for sightseeing. After checking into our hotel room and dropping off our luggage, we were off to see as much of Munich as we could in just one day. 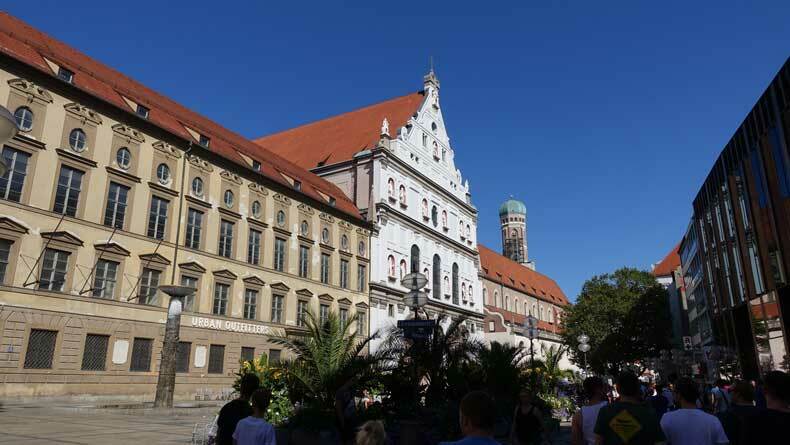 From the hotel it is approximate a 15-minute walk to Marienplatz, the main square in Munich. Luckily, there are also several things to do along the route. 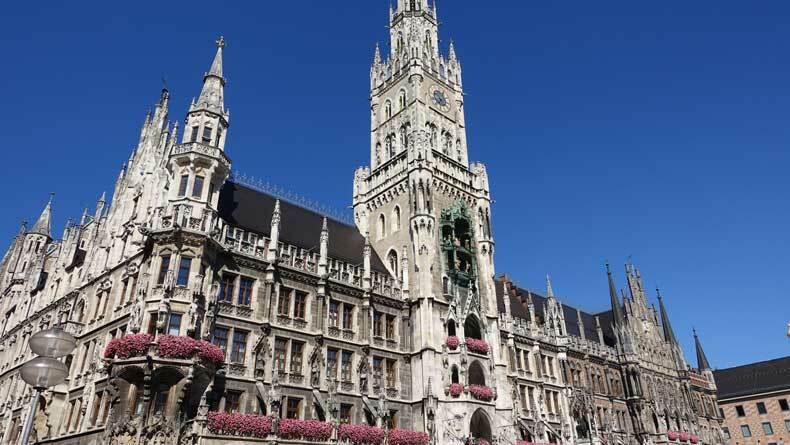 With only one day in Munich you obviously will not be able to see all of the tourist sights, or even spend an adequate amount of time appreciating the ones you do visit. But in the short amount of time we were were there, we were able to hit a few of the major highlights. Along the way to Marienplatz, we walked through the bustling pedestrian commercial district of Karlsplatz. Kids ran through a splash fountain and locals and tourists alike gathered and enjoyed an afternoon coffee or meal. There are a lot of little shops and restaurants in this zone, so it’s a great place to people watch, window shop or enjoy a quick lunch. You’ll find everything from Gucci to H&M, to smaller stores selling lederhosen, dirdls, and German souvenirs. Just a short distance up the pedestrian walkway you’ll find St. Michael’s Cathedral. While the outside is pretty, the inside of the Renaissance-style church is much more impressive. In fact, it’s stunning. Built in the late 1500’s, the church was damaged during World War II, but later restored to it’s original beauty. 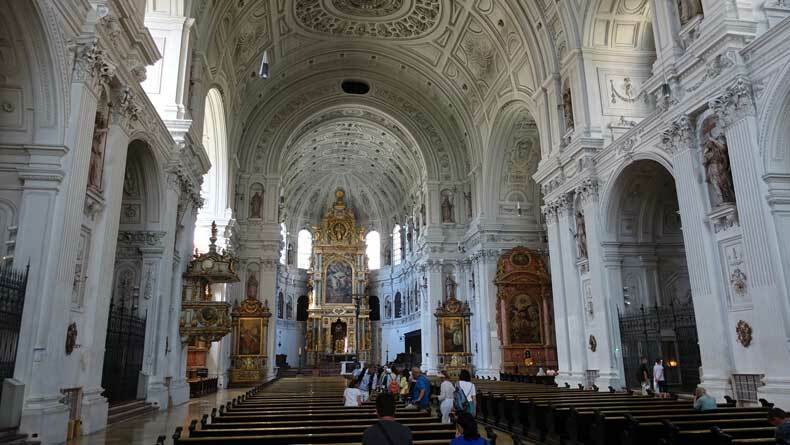 The church is free to enter and is an easy and quick stop on your way to Munich’s main square. Marienplatz is Munich’s main square. The new town hall dominates the square and is quite a remarkable piece of architecture. At the center of the town hall is the famous clock tower, or Glockenspiel, which comes to life at 11 a.m., noon, and 5 p.m. each day. Of all of the animated clock towers we’ve seen, the Glockenspiel is my favorite. The life size characters spin and dance for several minutes as crowds by the hundreds gather to watch. To get a great view of the famous square you can climb the clock tower or climb the 299 steps to reach the observation tower of St, Peter’s Church across from the new town hall. If you only have one day in Munich, Marienplatz should be your first stop! 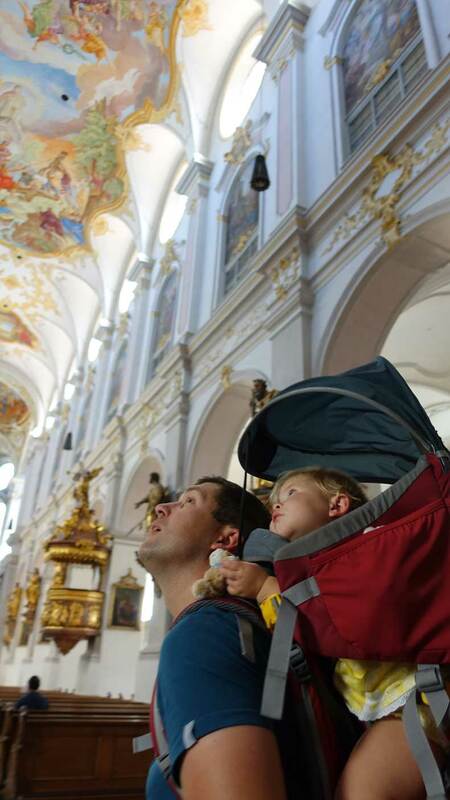 Visiting and touring St. Peter’s Church is a must, even if you only have one day in Munich. 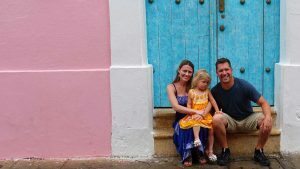 We didn’t get to climb the tower because we were traveling with our 18-month-old daughter. She was too young to climb herself without taking a full day to get up the stairs. And our child carrier backpack was too large to fit through the narrow passageways that often require you to squeeze past other people going the opposite direction on the same staircase. So we skipped the climb. But if you plan to climb the tower, there is a small fee to do so and the views are spectacular. Even if you don’t want to climb the tower, the church is definitely worth visiting. It is the oldest parish church in Munich, and it is absolutely lovely! 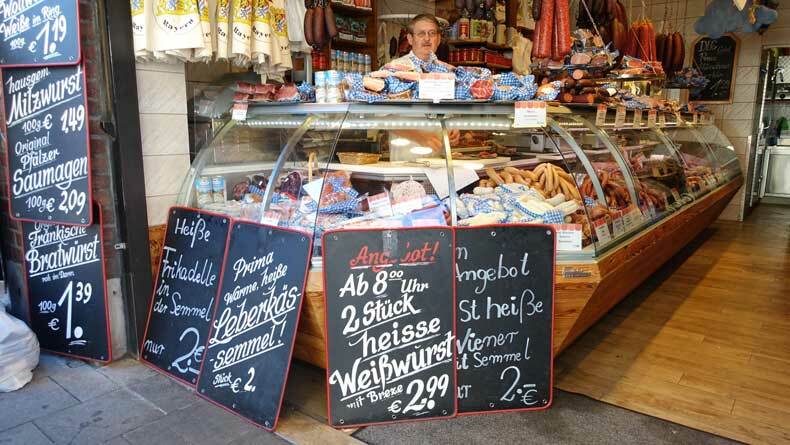 Directly next to St. Peter’s Church and just around the corner from Marienplatz is the Viktualienmarkt. This is a large outdoor food market with a ton of different vendors offering everything from gourmet meals to pretzels and sausages. Visiting local markets is one of my favorite things to do in a new place, and this particular market lived up to the hype. 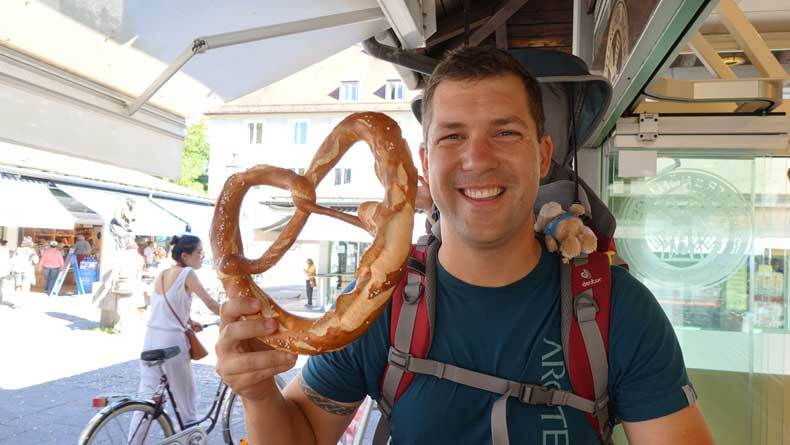 It is a great place to grab an inexpensive and authentic German lunch (or a pretzel bigger than your head). Plus, we loved the energy and atmosphere of the Viktualienmarkt. Tip for those visiting the Viktualienmarkt: Not all of the vendors at Viktualienmarkt accept credit cards. It is one of the best things to know before visiting Munich. Make sure you have carry euros because many places do not accept credit cards for small purchases. You can always ask if they accept credit cards before you order. Ninety percent of people in Germany speak wonderful English, so you can get by without knowing German. We always recommend learning a few key words or phrases in a country’s native language before a trip. 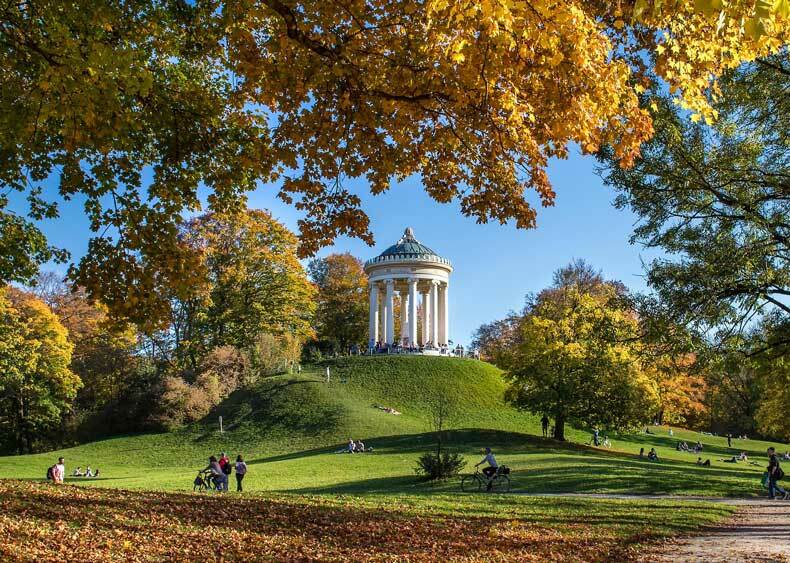 Munich’s English Garden is comparable to New York City’s Central Park and is home to several great beer gardens. This urban park is particularly a good place to visit with kids as there is plenty of room for them to run around and play. 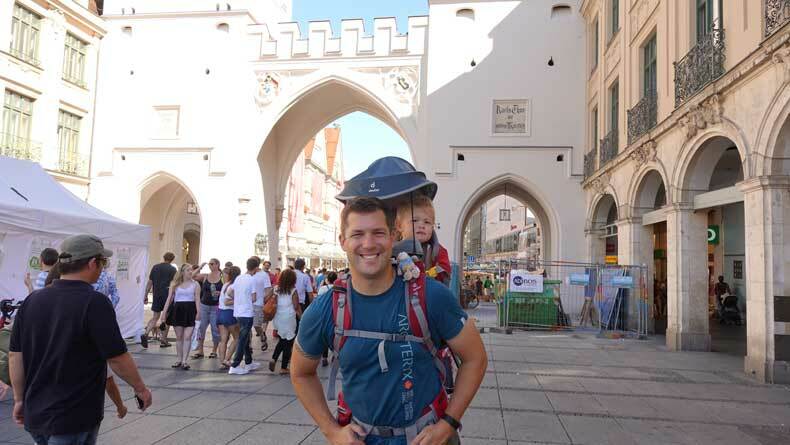 Plus beer gardens in Munich Germany are family-friendly. On the way back to the hotel, stop off along Maximilian Strasse or one of the shops or department stores in Karlsplatz and at least try on lederhosen (for men) or a dirndl (for women). 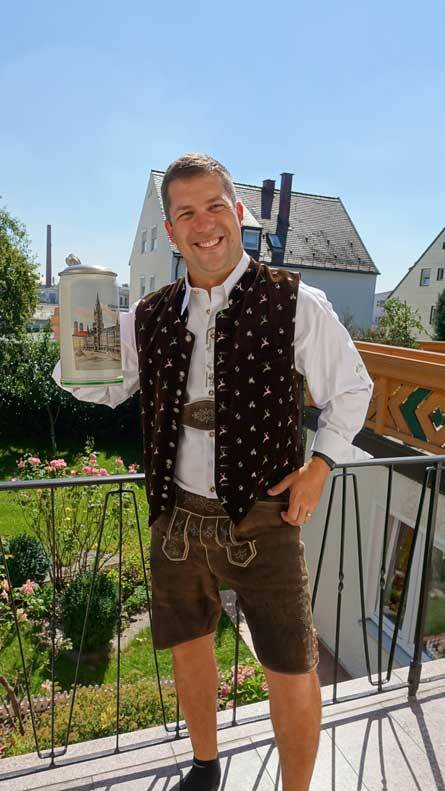 These traditional Bavarian outfits are often worn to festivals and special events in Bavaria. After trying them on we later purchased our own lederhosen and dirndl that will always remind us of our trip. We now host Oktoberfest parties every year for an excuse to wear them! Hopefully someday we will actually make it back to Munich for the real festival. Munich is the tourism capital of Germany. There is so much to do that we could have spent an entire week or more. I guess this gives us an excuse to go back. But if you have a bit more than just one day in Munich, here are a few more things to see and experience. The palace is a huge complex that could take a day to explore. The wonderful Royal Gardens at the palace would be another great place to visit with kids. An audio tour of the palace walks you through the history of Bavarian rulers and the palace itself, while the gardens give kids an opportunity to burn some energy and run around. If you like history and want to know more about Bavarian rulers of old, the Munich Residenz would be the place to visit. It is the former royal palace of Bavarian monarchs. As you can probably tell, I love pretty churches. Asam Church is probably one of Munich’s most ornate churches. It’s small, so a visit to the church wouldn’t take much time and is only a short walk from the Marienplatz. 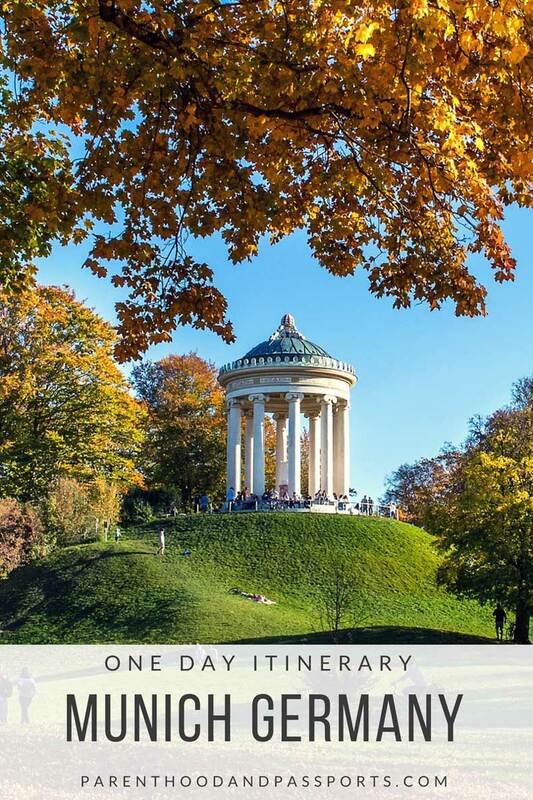 You could definitely fit this into your itinerary for half day in Munich. This is actually located just outside of Munich but would be worth a visit. The abbey runs a brewery, which is an unusual concept in America. But in Germany it isn’t uncommon for monks to brew beer. From what I’m told the beer is really good too. How cool would it be to drink beer brewed by monks? Neuschwanstein Castle is perhaps one of the world’s most famous castles. The castle was the inspiration for Walt Disney’s Sleeping Beauty castle which is pictured on the Disney logo. Visiting Neaschwanstein Castle can easily be done as a day trip from Munich. It will take about 2 hours each way to get to Neuschwanstein Castle, but it will be well worth the trip! Have you visited Munich, Germany? Leave us a comment and let us know your favorite attractions in the Bavarian city. Those cathedrals are spectacular! I wouldnt have picked Munich to have such amazing architecture before reading this! The cathedrals are beautiful there, at least near the town center. Definitely worth a stop inside if you like architecture. Munich is such a great city! Our boys loved the Glockenspiel. Definitely want to go back someday and spend more time there. I feel like we barely saw 1% of what there is to see and do there. Love Munich! One of my favorites there is Hofbrau Haus, the pretzels are amazing! And I agree, local markets is the one thing I have to do no matter where we are. That’s where all the good food is! Yes! I’ve eaten better food from small street vendors at local markets than in fancy restaurants. We’re headed to Munich in November. Although we don’t have set plans yet, some of those pretzels as big as our heads are definitely going to happen. Yes! The giant pretzels and lots of different sausages are musts in Germany. Well, you saw a lot in half a day! I love the lederhosen and dirndl! Ha! Thank you. Now we just need to go back to Bavaria so we can actually wear them. We went to an Oktoberfest event in the states and we were the ONLY ones wearing them. That happened to us when we were in Dublin. Poured rain the entire time. In fact, it rained all but one day while we were in Ireland. ? I guess that’s why it’s so green there, but it kept us from truly experiencing a lot of places. Interesting! I can see that this would be a great help if one had a layover in Munich or just a short amount of time. I for one would head straight for the giant pretzels! Looks like fun; thanks for sharing your experiences! Yes, the giant pretzels are a must! Luckily, you can find them all over Munich. They are definitely better than pretzels in the US where I live. I definitely want to visit Munich some day. There is so much history, art and architecture to explore. For 1/2 a day, you were able to fit a lot in. Just another reason to go back to Germany to see more of the sites on your list. Agree! Of course, no matter where we go or how long we stay, I feel like we never have enough time to see it all. I’ve never visited Munich and I’m not a big fan of Germany. But these Beffroi-like buildings are so beautiful!!! It’s very similar to Belgium. They also always put a lot of flowers there and I was very surprised by the magnificent personal gardens each time I went there. I love the bell towers and the architecture in general. Very picturesque. And of course, flowers always add an extra layer of beauty.